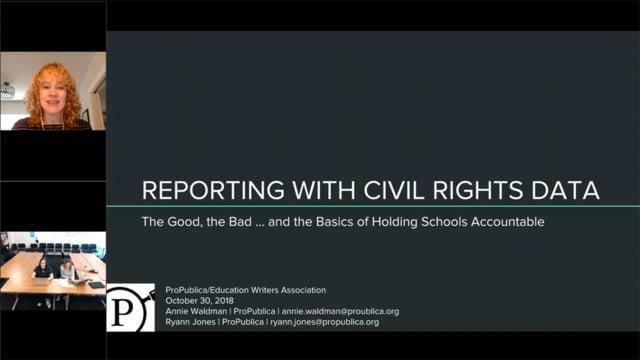 In this webinar, Annie Waldman, who covers education at ProPublica, and Ryann Jones, ProPublica’s deputy editor for data, demonstrate Miseducation, a new interactive database of federal civil rights data that journalists can use to report on issues of fairness and access at the local level. In recent years, Waldman and Jones have worked extensively with available data to identify national patterns and report on problems with specific school districts. What data is available to evaluate how your local schools and districts perform on measures of equal opportunity for students? How can reporters assess differences across their state or district to identify promising angles for their stories? What additional information and resources are available for reporters to go beyond the civil rights data?